Olentangy’s Sean Marks (12) fires a jumper during a game against rival Olentangy Liberty last season. 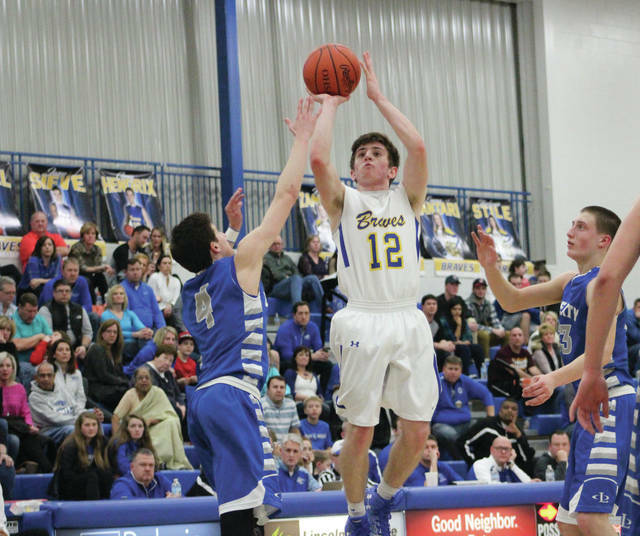 The Olentangy boys basketball team got hot toward the end of last season and second-year coach John Feasel thinks that momentum carried through to the offseason. Olentangy was three games under .500 when it picked up steam with OCC-Buckeye wins over Westerville Central and rivals Olentangy Orange and Olentangy Liberty to finish fourth in the league at 4-6. Olentangy added non-league wins over Mansfield Senior and Marysville to close out the regular season. A first-round upset at league foe Westerville North in the Division I district tournament capped the win streak before falling at Grove City in the second round to close the year 13-11 overall. Olentangy lost four off that squad, including two of its top three scorers in Jason Sieve and Greg Hendrix and role players Nathan Riedel and Will Elmore. The third of last year’s scoring trio included junior Sean Marks, who was second on the team in scoring (14.8 points per game) and steals (1.2 per game) and tops in assists (3.0 per game). Senior Jerred Kinnaird, who was second on the team with 5.2 rebounds per game, returns along with fellow seniors Kyle Milliron and Adam Wiff, who will provide leadership in key roles this season. Junior Luke Riedel and Alex Sieve are expected to be major contributors this season as well. Juniors Noah Gossett, Caleb Steele and Sutton Bucci will add depth. Steele, who saw action in six games last season, should provide some much-needed size at 6-foot-3 or 6-foot-4 depending on his shoes. “I really don’t like having tall guys around the program,” Feasel quipped. “People ask me, ‘Are you ever going to have any tall guys?’ I would love to have a ton of them. Right now, they’re coming. If you look at our JV team it’s bigger than our varsity team. If you look at our freshman team it’s bigger than our JV team. Feasel expects to be right in the mix this season in the OCC-Buckeye in spite of the vertical challenges. He sees Olentangy Liberty and Westerville North as favorites to win the league and Olentangy Orange, Westerville South and Westerville Central as tough beats in a more balanced OCC-Buckeye this season. Olentangy opens at home with Marion Harding Thursday at 7:30 p.m. in a non-league schedule highlighted by home matchups with Upper Arlington (Jan. 9), Big Walnut (Jan. 23), Thomas Worthington (Feb. 10) and Marysville (Feb. 20). Trips to Walt Disney World over winter break (Dec. 27-29) as well as Dublin Coffman (Jan. 6) and Hilliard Davidson (Feb. 6) highlight the road slate.